The Semantic Danielou-53 comes under the form of a Mac OS X or Windows application whose command window includes two keyboards played using a mouse, trackpad, or other input device. 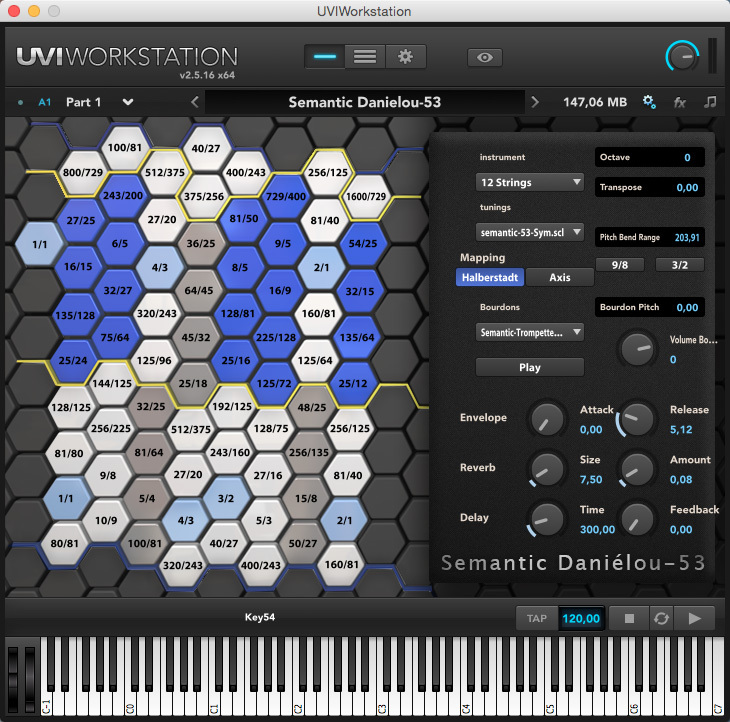 One keyboard we will call “Hex”, with hexagonal keys in a honeycomb layout, limited to a little more than an octave but allowing the display of the whole Semantic scale (53 notes per octave). The second keyboard, below, we will call “Hal”, with classical “piano keys” (this form of keyboard having its origin in the town of Halberstadt), having 7 white keys and 5 blacks keys per octave extended to 8 octaves, allowing to slide in continuity on all the keys. Notice that for all the tunings, the intervals with C (1/1) are indicated in the form of their ratios on the Hex keys. On the upper part to the right of the Hex keyboard, the “Instrument” menu allows a choice of 28 different timbres specially chosen for each instrument. It is transposable in octaves, along with a master tuning and a fine-tuning with a precision of one cent, while the pitchbend range (modulation wheel) by default is one major tone (9/8) or a perfect fifth (3/2), with the option of being tuned differently, to a precision of one-hundredth of a cent. – Demonstration tunings (genesis of the main harmonic coincidences of the Semantic). Most of the tunings have their mappings conceived for a 12 notes/octave interpretation, and for some others 24, 36, 48, or 53 notes/octave as for the Semantic-53 default tuning (see the full version 1.1 list of tunings in the supporting documents). One essential element for appreciating the Semantic just intonation is a tunable drone, available via the “Play” button. Its pitch is in C by default, with a three-octaves choice, and independent volume control. A general volume control is situated at the upper right of the window, with a VU-meter in decibels. In one last section under the preceding ones, three modules with their proper settings allow a sound envelope control as well as two sound effects, reverberation, and delay.